My motorcycle boots make slushy noises. I am following a charming young bellboy, whose head is crowned by tangled curly hair. Behind us I leave a trickle of mud and water. The employees of Rooms Hotel Tbilisi run through the lobby excitedly. The hotel is located in an old Soviet printing factory. Back those days propaganda was printed on paper in this building, today the hotel is probably the most fancy place of Tbilisi. “Last night Sophia Loren stayed in the penthouse,” whispers the bellboy when he notices that I watch the scenery confused. „Everybody went crazy!” „What do you think about her?” I ask him. He sighs. “I can not judge. She is 80 years old! Maybe a little too old for me.” His honesty makes me smile. I just drove through the pouring rain for three hours and my clothes are dripping from moisture and dirt. Most of the other guests are well dressed – and even if not at least more clean than I am. The hotel lounge is covered with Vivienne Westwood rugs and the general hubbub is accompanied by loud electric music. The contrast to the mountain village of Bakuriani, where I spent my last night at an old lady’s little house, could hardly be bigger. Back in the so-called high culture, I feel almost like a foreign object. And I wonder if these dressed up people have any clue, that there are so many more hearts beating in Georgia. Tired of city life but at least sleeping in the most comfortable bed I had (and will have) for a while in Rooms Hotel Tbilisi. There is barely anything that a hot shower can’t make better. Nevertheless, my acclimatization with the normal civilization of a big city happens a bit slower than I expected. When watching the other hotel guests, it seems quite strange to me that some women have operated breasts and obviously spent as much time at their hairdresser, as I need to ride a distance of 300 kilometers. So I decide to make an approach to everyday life step by step and start with all the things, that I normally don’t have time for when traveling: doing my laundry, reduce the chaos in my travel bag to a minimum and buy cosmetics (deodorant and toothpaste). To my big surprise the first well-stocked supermarket I visit offers the spray I usually buy. Considering the hard and sweaty times that might await me, I buy two of them. But back at the hotel I realize that the Georgians have decided to give it a completely different scent. First I am disappointed – but then I tell myself that engaging with a new country maybe already starts with its different smell. 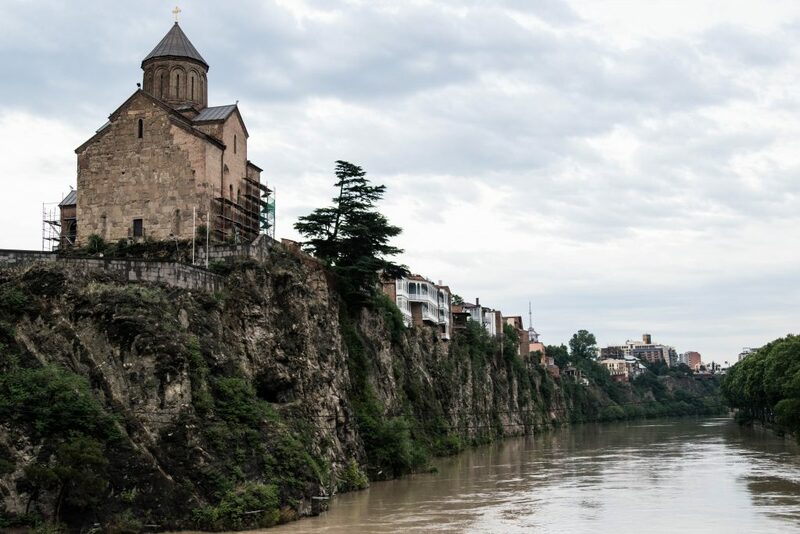 Even in lively Tbilisi you can experience the heritage of hundreds of years. The area around the Rooms Hotel seems to be the linchpin of the creative scene of the city. “Three years ago, everything was different. We can still hardly believe that lots of western tourists are visiting Tbilisi now. And that so many rave about how great it is here”, tells me Tata, a Georgian who provides me with countless tips for the city. I can barely keep up with making notes of all the places and restaurants that she tells me to visit. Around the corner just opened a new concept store. “Chaos” is written in red letters above a simple entrance. Inside you find neatly arranged fancy clothes of young designers like the Georgian George Keburia or the Ukrainian Anton Belinsky. In one room is a pingpong table. The young people playing in their colorful clothes could be draped for a photo shoot of a magazine. I can not help myself: Since I am in Tbilisi, I feel dressed wrong all the time. Either I’m surrounded by women with excessive upper lips and too much glittering jewels, or I feel rather boring and german in my clothes that I now wear every day compared to the slightly younger generation with their tousled blue or pink hair and ripped jeans. Tbilisi has a colorful excited optimism that makes Georgia’s capital one of the most interesting travel destinations at the moment. And this all works so well, because they don’t try to adapt a western style but developments take place in context of the history of their own country. 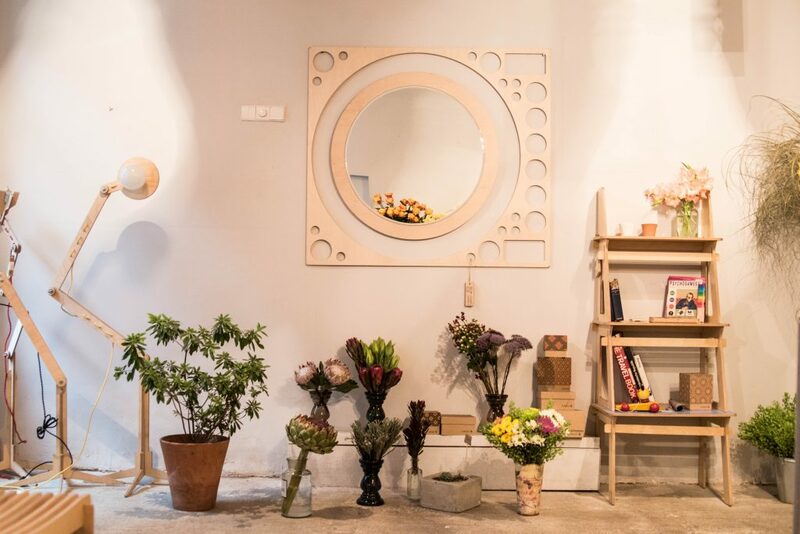 Funduki furniture and flower store in Tbilisi. Still, I’m secretly relieved the next morning that the question how to dress does not come up. I just put on my familiar and now thankfully dry motorcycle gear. People told me that in eastern Georgia there is supposed to be a really nice wine area (after an extensive tasting of Georgian wine the night before I can confirm it’s quality), in the north there are the Caucasus Mountains calling. I opt for the mountains – as well because I really liked Rooms Hotel in Tbilisi and there is a second branch in the mountain village Stepantsminda. Along the way the road signs show the distance to Yerevan, Baku and Tehran. But even if you do not want to go that far you only need two and a half hours from Tbilisi to be in another world. 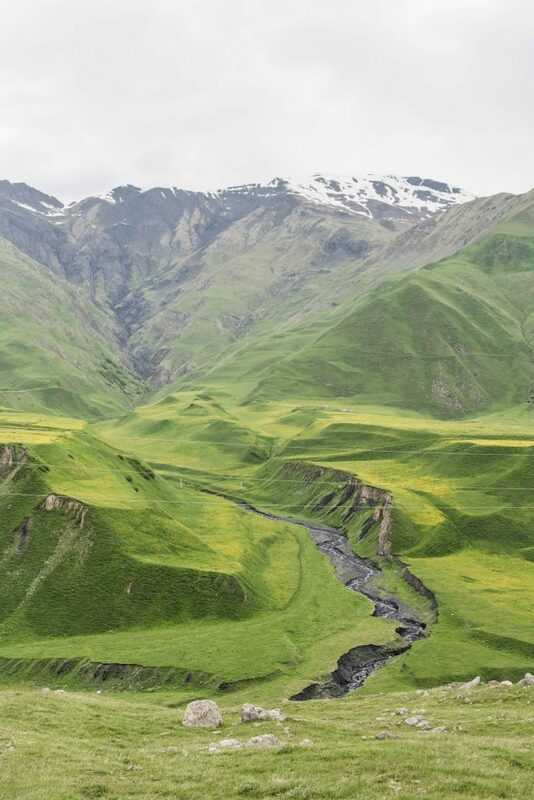 The lush green mountains of Georgia on the way to Kazbegi. Stepantsminda could originate from a completely different decade. Cows line shoulder to shoulder with stray dogs and the old tractors feel highly motorized compared to the other vehicles driving in the hilly streets. But as well in Stepantsminda you can feel the spirit of change – especially if you sit on on the terrace of Rooms Hotel while listening to soft sounds of electronic music enjoying the view on Kasbeks 5,000 meters high peak. Here I got to know Dario who is not only responsible for the power grid in Kazbegi and beyond the mountains (“Sure, I could switch off electricity of the whole town …”), but who also has a company, that shows tourists the area on a motorbike. The church Gergeti. From here you can start to climb the 5.000 meter peak of mount Kasbek. I don’t know whether it is the environment of the mountains or the presence of the local people who sip their wine like me next to the Russian tourists on the stunning terrace. 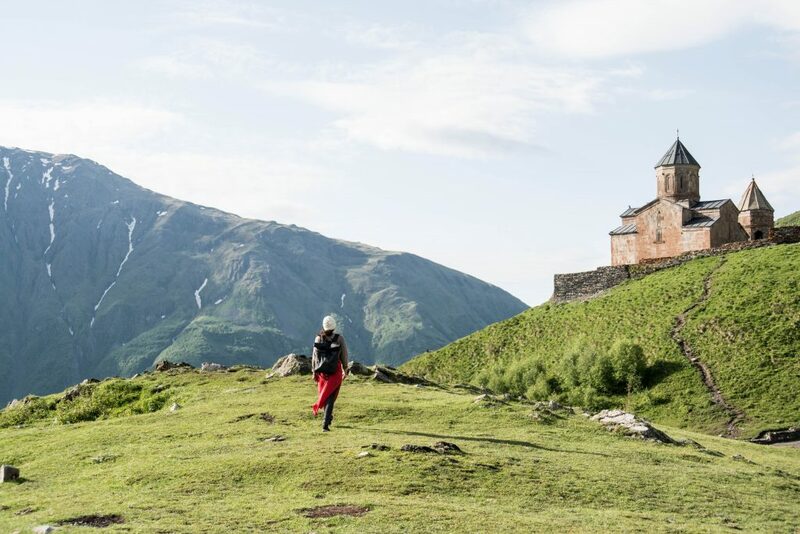 But in Kazbegi all the contradictions that I couldn’t pair in my brain suddenly fit like a puzzle . The different concepts of life and the search for “worse” or “better” and as well to find my own spot between all these options had made me blind. But Stepantsminda succeeds in what many places fight with: The opposites work together without destroying the the soul of Georgia or the original rural life by tourist resorts. At that moment I decide, to not judge my experiences by a „better“ or „worse“ but to be thankful for all the contrasts that don’t have to exclude each other. 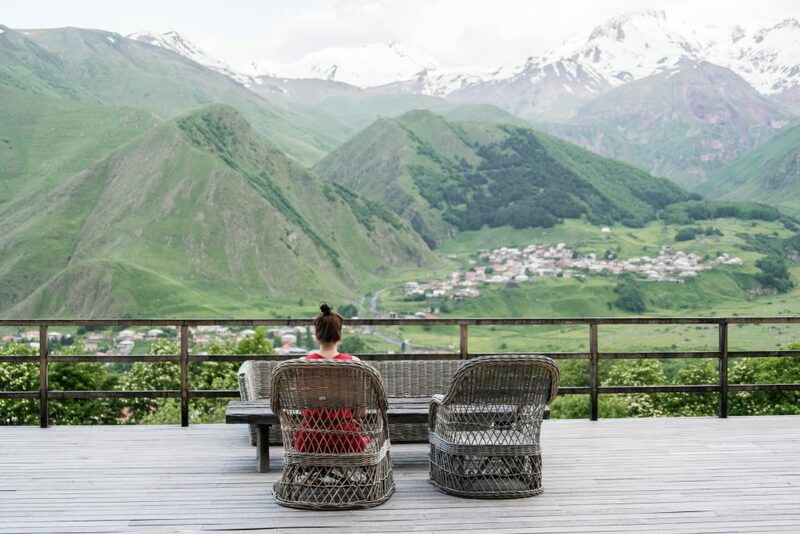 Terrace with a View: Rooms Hotel Kazbegi. This article was written for Glamour Germany. Click here for the german version.